He has a 50% resistance to fire and a 25% weakness to frost, and knows the Fire Breath, Frost Breath and Unrelenting Force shouts, as well as the Dragon Storm Call shout unique to him. During the quest A Blade in the Dark, Alduin resurrects the dead dragon Sahloknir from his burial place, revealing how the rest of the dragons returned after being slain centuries ago. After this quest, the player may get to see the rare occasion where Alduin resurrects another, leveled dragon. When resurrecting other dragons, Alduin can be spotted from a distance, and more easily heard thanks to his roars. It's easy to distinguish Alduin from other dragons, as he will stay far in the distance, flying around, unlike normal wild dragons (who will fly right to you). Alduin won't go away from the location unless the player moves close [verification needed — see talk page]. As soon as the player gets close enough, Alduin starts to speak in the dragon language. A new dragon will appear (having been resurrected), which will speak back to Alduin. After this, Alduin flies away and the resurrected dragon attacks the player. If you encounter Alduin during the resurrection of a dragon, he can be hit with any long-ranged attack. However, it appears that he is not actually hit, as no health bar appears. He does appear as hostile at that moment, showing as a red dot on your compass. The red dot will disappear after Alduin flies away again. During the resurrection of a dragon, Alduin will occasionally shout, and the sky will darken. 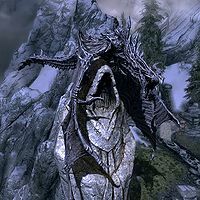 Alduin has a unique shout called Dragon Storm Call, which is very similar to Storm Call, and causes fiery meteors to rain from the sky. When Alduin resurrects a dragon he says "(dragon name) zil gro dovah ulse" then uses a shout "slen tiid vo!" If you deal enough damage to him when he is resurrecting a dragon, he will crash land on the ground, then take flight again and fly off. Alduin may remark "You may have picked up the weapons of my ancient foes, but you are not their equal!" during the quest Alduin's Bane. Alduin is voiced by Daniel Riordan. There's a very small chance that Alduin will use Unrelenting Force on the player if the player tries to damage Alduin while he is resurrecting a dragon. When encountering Alduin raising a dragon as a random encounter, chasing him off before he completes the resurrection causes the dragon burial mound to become stuck in the 'bonfire of energy' state. This can be fixed using the console, at least as far as the visual effects go: look upwards at the 'bonfire', open the console, click on the fire effect and use the disable command. Look at the middle of the dragon mound, click on it, and use the disable command again. This will make both the special effect and the mound cover disappear. 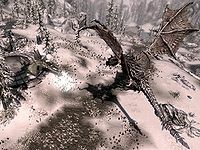 After learning Dragonrend during Alduin's Bane, Alduin will sometimes be invincible. Escaping the battle by running down the Throat of the World and fast-traveling back appears to make him vulnerable to damage again. This page was last modified on 11 September 2018, at 10:20.